Will Davos mountains be magic for oil markets? Watch: Will Davos mountains be magic for oil markets? 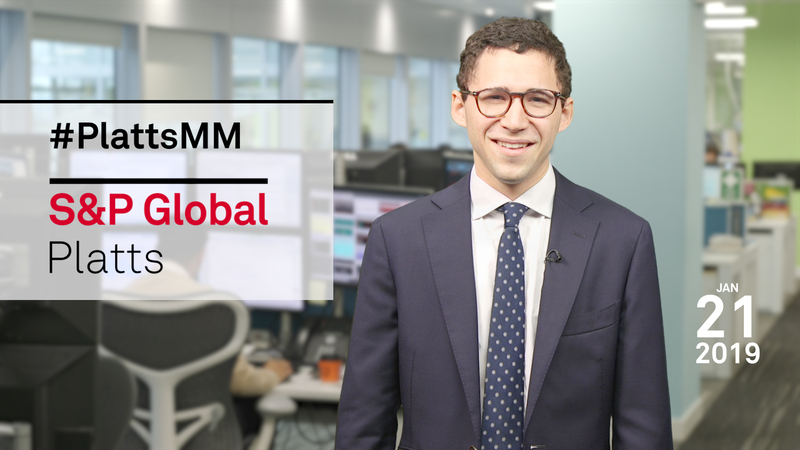 In this week's Market Movers: European gas and power markets eye the impact of a cold snap; while the Russian deep sea port wheat price could be heading for fresh highs. Antoine Simon, market reporter, European Gas & Power, presents. But first, the Swiss ski resort of Davos will host the world's financial and political elite this week for the World Economic Forum. Russian energy minister Alexander Novak and his Saudi counterpart Khalid al-Falih are set to meet at the event, with oil production targets high on the agenda for both countries. The European natural gas market is set for its first real test of the winter as a prolonged cold snap is set to engulf the continent this week. Meanwhile, Russian deep sea port wheat is expected to smash through its all-time high of $249 a metric ton in the next week or two, as supply grows dangerously thin. Another market hitting fresh highs is palladium, with analysts now questioning how high prices need to get before carmakers start switching back to platinum for use in exhausts. This leads to our social media question for the week: For how much longer can palladium sustain its rally? Tweet us your thoughts with the hashtag #PlattsMM. Elsewhere, in base metals, there are expectations the US Treasury Department may lift sanctions as early as this week against Russian aluminum producer Rusal. Finally, in the petrochemicals market participants will be waiting to hear further details on the impact of a fire at the Versalis steam cracker in Priolo, Italy. In this week's highlights: European gas and power markets eye the impact of a cold snap; while the Russian deep sea port wheat price could be heading for fresh highs. But first, the Swiss ski resort of Davos will host the world's financial and political elite this week for the World Economic Forum. Russian energy minister Alexander Novak and his Saudi counterpart Khalid al-Falih are set to meet at the event, with oil production targets high on the agenda for both countries. US President Donald Trump has canceled his delegation's visit while the government shutdown continues in Washington. In Europe, the weather will not only be cold up in the Alps. The European gas market is set for its first real test of the winter as a prolonged cold snap is set to engulf the continent this week. Temperatures in continental northwestern Europe are forecast to fall to as much as eight degrees Celsius below seasonal norms; but the UK is set to escape such dramatic falls. However, the gas supply picture looks healthy. Storage stocks are more than seven billion cubic meters higher year on year -- and as you can see from the chart -- supplies of LNG as well as pipeline gas from the UK, Norway and Russia are abundant. Looking at gas supply further out, market participants will be monitoring the outcome of a meeting between Russia, Ukrainian and the EU meeting in Brussels today. The talks will be about Russian gas transit to Europe after 2020, when the current agreement between Russia and Ukraine expires. The European Commission wants to keep the Ukrainian route open and viable even after the controversial Nord Stream 2 pipeline which goes directly to Germany from Russia starts up at the end of 2019. Russia's transit choices can have a dramatic impact on how gas flows around Europe. Staying in Russia, Russian deep sea port wheat is expected to smash through its all-time high of $249 a metric ton in the next week or two, as supply grows dangerously thin. With virtually all wheat close to ports already committed, sellers are hunting for wheat in more remote regions, adding a long time lag and higher logistical premium. he only cap on Russian wheat's upside is cheaper alternatives in Europe and the US. However, supply out of Europe is limited. Another market hitting fresh highs is palladium. The metal, like its close cousin platinum, is used to reduce emissions from diesel vehicle exhausts. Prices have surged almost 30% since November, hitting a fresh high last week on tight supply. Palladium has benefited from the diesel emissions scandal at the expense of platinum. Analysts now question how high palladium prices need to get before carmakers start switching back to platinum for use in exhausts. Platinum prices have fallen nearly 6% over the same period. Moving from precious to base metals, there are expectations the US Treasury Department may lift sanctions as early as this week against Russian aluminum producer Rusal, so watch out for that. The Russian company accounts for 7% of the world's primary aluminum supplies. There has already been a direct impact on ethylene and propylene production, and the market is waiting for a clearer picture of the impact on aromatics. Further tightening supply, the force majeure on ethylene from Borealis' Stenungsund cracker in Norway will likely remain in place this week. It has been closed since the end of December due to a power failure. A trader estimated that the two outages had removed 5 to 7% of European ethylene capacity. That's it for today. Thanks for kicking off your Monday with us, and have a great week ahead!